Today brings us Mr. Kitty’s second chapter, marking the halfway point of the novel. I hope you’ve all enjoyed it so far and continue to join us in the future as we reach the conclusion of The Asymptote’s Tail. And remember, if you don’t want to wait the ten weeks that’ll still take, you can order a full copy of the novel (in paperback or eBook format) on Amazon through this link. He was dreaming about a fat, juicy pigeon. The kind that was stupid enough not to fly away as long as he moved in short bursts, stopping for a moment in between. Humans the pigeons understood. It was easy to tell when a human came barreling down the sidewalk toward you, all eyes on their destination, no thought to spare for the stupid birds flapping about. But Mr. Kitty would slink a little closer and stop, slink a little closer and stop, each time going a different distance or speed, or stopping in between for a different amount of time. It was that erraticism, that randomness, which kept the pigeons unsure of how long they had to scrape for food before it was time to fly away or be torn to bits and eaten alive. He was shaking his tail, gathering his haunches, about to pounce on a particularly plump pigeon when the sound of Tillie rushing into the spare room and slamming the door behind her woke him from his nap with a jump. Tillie didn’t even notice him. She threw her purse on the chair and plopped down onto the bed. Mr. Kitty walked over to knead her lap, but as he put his first paw on her, she flung him off, locked the bedroom door, then sat back on the bed with her head in her hands, sobbing. “What’s wrong?” Mr. Kitty meowed. Mr. Kitty tried to roll over on his back in her lap and show her his belly to make her feel better, but the phone rang, and she jumped up to grab it out of her purse, pushing him down onto the floor. She stared wide-eyed at the screen, then sighed in relief and answered it. “No,” she said in her baby voice. “I know you wouldn’t. You sweet wittle fing you.” The doorbell rang. Tillie stood up, pushing Mr. Kitty onto the floor for the third time, and crept over to the bedroom door. She turned the deadbolt as quietly as she could and cracked the door to peek through with one eye. “Tiiilllliie! Doorbell!” her dad called from the living room. She didn’t answer. Mr. Kitty tried to push his way through her legs, but she scooted him back with her foot, so he sat on the floor behind her and licked himself. With one more ring and a groan, her dad called, “Alright!” then walked slowly backwards out of the living room, trying not to miss any bit of the game. When he had gotten far enough into the hall that he couldn’t see the TV anymore, he turned to the door straight away and opened it. “Of course, darling,” her dad said, getting back to his game in the living room. “You and your friend feel free to order anything from the printer,” he said with a wave, not looking at them. “Oooh, I think I’ll have—” Shelley started, but Tillie grabbed her arm and dragged her back into the room where Mr. Kitty was waiting. She tossed Shelley on the bed, then closed and locked the door behind them. Mr. Kitty jumped up onto Shelley’s lap. He rubbed his head on her arm and meowed to say that it was okay for her to admit that she didn’t know. “Then why do we have the robots?” Tillie said, standing up and getting close to Shelley, towering over her. Shelley was leaning so far back on the bed to get away from her that Mr. Kitty was sitting on her stomach instead of her lap. She made for the door, but Tillie stopped her. “No,” she said. “Don’t go. I’m sorry. I didn’t mean to—I’m just really stressed right now.” She sat down on the bed with a bounce, and Mr. Kitty jumped onto her lap to purr. “I—I don’t know if you can,” Tillie said. Moisture welled up behind her eyes, and Mr. Kitty purred louder. “Who say, I say, I say, let em have it…with nooo problem. I guar—un—tee!” they sang in unison then laughed together. “Shoot, girl. Ain’t no one gonna know but your cat here, and he won’t put me in any danger. Will he? Will you?” She squeezed his cheek. “A woman’s house?” Shelley said, raising an eyebrow. Shelley stopped, sighed, and turned around. Mr. Kitty didn’t stop, though. He was tired of listening to them. He’d figure out what Tillie meant to do about it later. For now he had to get out of the house. He had been caged up like a human for too long and he needed to stretch his legs a bit. The house had a big yard, and it was only a short walk from there to the public elevator system. 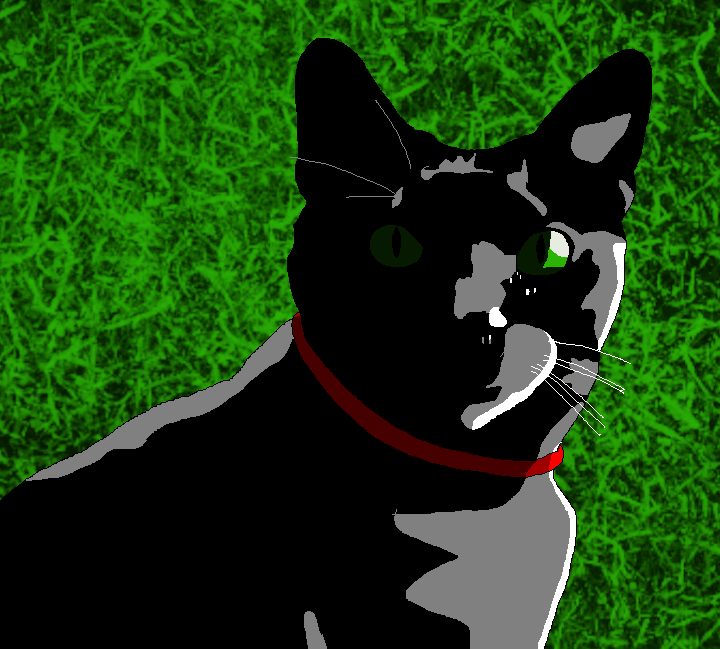 Mr. Kitty took his time slinking through the garden along the yard’s metal fence, rubbing his face on every hard stick he passed, smelling every other plant, even taking a bite or two out of a few pieces of grass—important for his digestion. He was so lost in the smells and colors that the sound of Shelley’s feet coming down the walkway toward him made him jump. She went one way down the sidewalk, toward the elevator entrance, and he went the other, toward his favorite tree to climb. He stopped at the base of the tree to sharpen his claws on its roots. He loved the sound it made when his claws sank into the wood, and the feeling as they caught in the meat of the root which could only give way under the brute force of his animal strength. He gathered his haunches and zipped up to the first fat branch overlooking the neighborhood. None of the houses looked like they belonged next to each other with their extreme shifts in architecture and landscaping, but one thing they all had in common was that they were all huge and all set on a lot of land. Mr. Kitty pitied them down there, trapped in their houses, stuck in their web of sidewalks. They had access to more knowledge than most humans Mr. Kitty knew, but somehow they understood the least about the world. A sound of talking from above caught his attention. He recognized the voices. Those two kids were closer to freedom than anyone in the houses below him—except for maybe Tillie, who was making strides. He really liked those kids, too. They didn’t give up. They deserved a little reward for their perseverance, and he was in the position to give just that to them. He climbed up to the branch he was looking for and jumped into the air, gliding out where it looked like there was nothing to land on. He ended up landing on Pidgeon’s lap. “The cat!” the other kid said, standing on the branch. “Where’d it come from?” the other kid said. Mr. Kitty kneaded Pidgeon’s lap and purred. The other kid sat down, holding out a hand for Mr. Kitty to sniff, it smelled a bit like rat, a not altogether undelicious smell. “Through the hole,” Mr. Kitty meowed. “He’s trying to tell you,” Pidgeon said. “Here, I’ll show you,” Mr. Kitty said. He jumped off Pidgeon’s lap and hopped from limb to limb down the tree. “Follow him!” they yelled together. Mr. Kitty heard the sound of leaves rustling and branches breaking as they chased down after him. He hoped they hadn’t broken his landing pad in their descent—he would hate to find that out the next time he decided to come through that way. He stopped for a second on the soft grass to give them a chance to catch up, licking his feet to taste the difference in the soil, and when the sound of them chasing after him was close enough, he bound down the green strip towards a hole that could send them where they wanted to go—if they were willing to follow him. The hole was a few blocks away, and Mr. Kitty was much too fast for the little two-legged humans, so he had to treat them like pigeons in reverse. He would run out ahead, then stop to lick himself while they caught up, then run out ahead again, and repeat for the four blocks distance to the alley he was looking for. At the end was the tricky part. He could get into the restaurant easily enough—jumping through the broken window—but they wouldn’t follow him that way. He could wait for someone to open the door so they would be more likely to follow, but the timing on that was a long shot. Then there was the alley side of the hole, and from the looks of it, there was just enough trash for him to get the boost he needed. He let the kids get a little bit closer, so close they were shouting at each other, then he heard another human voice he didn’t recognize. It was too late to turn and find out who it was, though, because he was already bounding toward the dumpster. He jumped up onto a soggy box that almost gave way under his weight, onto the dumpster lid, then up two more boxes to claw his way into the building itself, giving him the last bit of momentum he needed to make the extra few feet into the hole to fall far and fast onto the carpet on the other side. He licked the pain out of his feet and listened for the sound of the human children following him. He heard some sounds, but nothing quite like they were climbing up after him. More like they were going the other way. He shook his head in pity. At least they had a new goal to work toward. Mr. Kitty sniffed the air. It took him a second to remember where this side of the hole let out, usually he used the side that was inside the restaurant. The feeling of the carpet suggested he was where Haley lived, but the smell gave it away. There was a vaguely chemical scent—something synthetic—and the air smelled extra oily. He walked down the hall and pushed his head through a door. Behind it was an office with a long desk. A huge window that looked out onto a vast wilderness with trees, hills, and animals everywhere made up the far wall of the room. There was no one sitting behind the desk, but Rosalind and Huey were sitting on two puffy chairs in the corner, staring out the window in silence. Mr. Kitty meowed to announce his presence and both looked around with a smile. Rosalind stood to get something out of the desk and sat back down. “You want some treats, Mr. Kitty?” she said, pouring a few crunchy, delicious-smelling bits onto a side table. Mr. Kitty jumped up to eat them while Rosalind and Huey took turns patting him. “Thanks,” Mr. Kitty meowed when he was done eating. “Are you gonna give me some of that wet food?” Mr. Kitty meowed. “That’s why I keep coming back,” he meowed. Rosalind took off his yellow collar and snapped a red one around his neck. “Beautiful,” she said, scooping Mr. Kitty up and kissing him on the head while he tried to squirm away from her. When she set him back on the table, he licked his paws and rubbed the kiss away. “You know I hate it,” Mr. Kitty meowed. Mr. Kitty continued licking himself. He got started, he might as well get the rest of his coat while he was at it. “Outland what?” Mr. Kitty meowed. She shuffled through the drawer again, and Mr. Kitty jumped off the table onto the desk to hurry her up. She pulled the tin open and set it down, and he licked all the juices off the top as quickly as he could then meowed that he was ready to go. “I’ll let him out,” Rosalind said, walking toward the hall he had come in through. “Thank you, Mr. Kitty,” Huey said, waving. Mr. Kitty stretched his legs and followed Rosalind out to the elevator at the other end of the carpeted hall. She opened the doors and Mr. Kitty climbed in. The doors closed, and the floor fell out from underneath him. When the elevator stopped falling, the doors opened and Mr. Kitty climbed out into a hall with hard, cold vinyl floors instead of soft carpet. He hated walking on the stuff. No wonder humans wore shoes all the time with the ridiculous concrete and vinyl they put everywhere they were supposed to walk. He turned through the hall into an office and jumped up onto the desk. No one was sitting there, but he knew she would be back soon. He licked his feet to get the cold, unnatural feeling of the vinyl floor away. There were more computer screens here than there were on Tillie’s dad’s desk, and the numbers seemed somehow more interesting, plus, the Scientist liked to watch TV while she worked, and Mr. Kitty enjoyed a little television himself every now and again. He wanted to see what was going on in the computer world, so he walked across the keyboard to get it going when the Scientist came in, holding a plate with a sandwich on it. “I’m full anyway,” Mr. Kitty meowed. Mr. Kitty walked out of the door, and instead of into the hall, he came out into his yard. He looked back, and as the door closed behind him, it disappeared. He walked through the spot in the air where the door had been to make sure it was gone. Satisfied, he turned and bound through the grass to sit at the front door of the house. “Anyone home?” he meowed as loud as he could. He knew her dad wouldn’t hear him, or care, but he thought Tillie might pick his voice up and prevent him from having to take the long way in. “Helloooo! I’m out here!” he tried one more time, then sat down to lick his feet. Maybe she wasn’t there. Or maybe she was actually in the bathroom this time. Either way, it didn’t seem like she was coming, so he got up and went around to the back of the house. He climbed up a big oak tree in the backyard to jump up onto the roof. This roof was just a little lower than the previous house’s, so it took him two jumps to get high enough to fly through the hole, out onto the metal grating on the other side. He landed with a clang and looked around with puffed up fur to make sure there was no one there to see him. There wasn’t. The floor here was even worse than the vinyl. If he wasn’t careful to keep his claws in while he walked, they would catch on the holes in the metal grating and break off when he lifted his foot. Even when he was careful he couldn’t prevent it from happening sometimes. And the stairs he had to climb down were made of the same metal grating. On top of that it, was impossible to stay silent while walking on it. He had to constantly look this way and that to be sure no one heard him. Finally, at the bottom of six flights, came the worst part of this entrance into his own house. It was a long, skinny strip of metal grating that curved around a wall into a tunnel of darkness with no escape but to go straight back the way he had come, that is if he could react fast enough when he finally saw who was coming. Luckily they couldn’t walk quietly on the metal grating either, so he usually heard them long before he saw them. He stopped at the bottom of the stairs and sniffed the air. It smelled stale, and oily, and there wasn’t much oxygen. He had to breathe deeply, even from walking down such few flights. He turned this ear then that toward the black tunnel and there was no sound. He slunk his way into the darkness, wishing there was another escape. He paid extra attention to keeping his claws in, stopping every few steps to be sure no one was coming. He had counted the steps so many times, he knew how close he was by reflex. Thirteen bursts of three steps, eleven bursts of two, and seven bursts of one. Not in that order, but do that number and he’d be there. He was fifteen steps away when he smelled it. It was oil, but it wasn’t oil. He knew that smell, but from where? He took a few steps closer and heard sobbing. Why would someone be sobbing down here? A few more steps and he saw the form on the ground, right in front of his exit. It didn’t see him yet, though. Or hear him. Or smell him. He could run up, use it as a jumping platform, and be gone before it had time to realize what had even happened. She jumped up and stopped crying all at once. The sound of it echoed through the empty tunnel. “Mr. Kitty. I—Is that you?” she said, taking the hood off her head. Mr. Kitty walked up to her and brushed his cheeks on her legs. “What are you doing here?” Mr. Kitty meowed. “Oh no,” Tillie said, slouching down. “I don’t know how to get out of here, either.” She started to sob again. “Wrapped up in it?” Mr. Kitty struggled to get away and ended up clawing her chest. Mr. Kitty jumped through the hole into Tillie’s dad’s office where he was sitting at the computer, watching numbers change on the screen, paying no attention to the cat who had just appeared in the room behind him. Mr. Kitty turned to see if she would come on her own, but he only heard the faint echo of her calling his name and sobbing. She was confused just like a human. “I worked for it,” he meowed. “Oh, I love you, too, Kitty,” she said, squeezing him tighter and driving the air out of his lungs. “The pictures I told you not to tell anyone about.” Her dad crossed his arms. “So you do know, then,” Tillie said, pushing him away and wiping her face with her sleeve. “What are you talking about, dear?” Her dad frowned, shaking his head. “So you don’t believe me then?” Tillie said, shaking her head. “Ugh, fine!” Tillie stormed out of the room, and Mr. Kitty chased after her. “Tillie!” her dad called, but he didn’t get up from his chair to chase them. Tillie went into the spare bedroom and started packing her things. “What are you doing?” Mr. Kitty meowed, standing on her backpack. Thanks again for reading. And don’t forget to pick up a full copy of the novel on Amazon today. Have a great weekend.